OnePlus 6T only launched a few weeks ago, but we're already salivating at the thought of what OnePlus has planned for its next flagship handset. Fortunately, we don't have to strain our collective imaginations too much since prominent YouTube channel TechConfigurations has launched a new concept video of the forthcoming flagship handset that reveals a stunning new design, slidable front-facing camera, and rear-mounted triple camera set-up. According to the TechConfigurations clip, the OnePlus 7 could boast an immersive 6.5-inch QHD AMOLED display with an edge-to-edge design. That would be a pretty hefty step-up in display resolution for the company, which has stuck with 1080p panels in order to eke out more battery life and preserve costs. Like the OnePlus 6T and OnePlus 6, the handset in the concept video has a glass front and back, surrounded by a metal chassis. The vertically-aligned camera system on the back has also returned, albeit with an additional lens. The three lens set-up, like the Huawei P20 Pro, would likely be used for improved bokeh-blur in the background of portrait shots, as well as photographs in tough, low-light conditions. 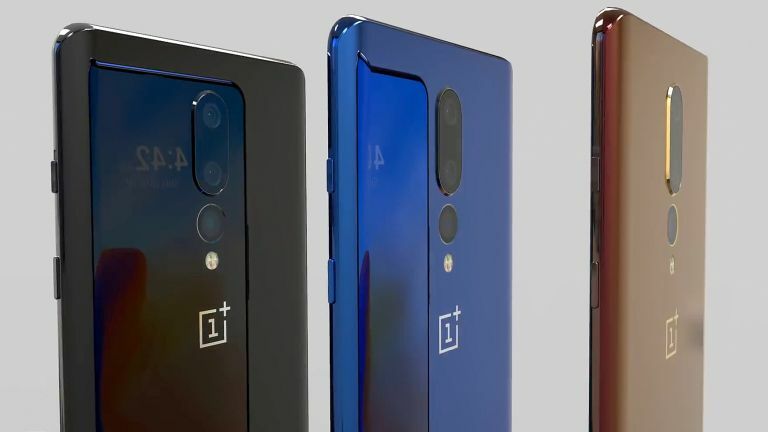 TechConfigurations envisions OnePlus 7 with an upgraded in-display fingerprint scanner that leverages ultrasonic technology, instead of the optical sensor currently used in the OnePlus 6T. The latter are fast and reliable through glass, however, these only offer a 2D scan of fingerprints. Ultrasonic options offer more accuracy. The biggest design flair on the OnePlus 7 is the sliding front-facing camera. Like the Xiaomi Mi Mix 3, the entire screen slides down manually to reveal the front-facing camera. This allows handset manufacturers to preserve the all-screen design, since the selfie camera, front-facing LED flash, proximity and ambient light sensors are all hidden away in a slidable drawer at the back of the handset. With the OnePlus 6T, the Shenzhen-based company shrunk the size of the notch to increase the amount of available screen real estate. It would make sense for the company to take that further with its next-generation handset and bundle all the sensors away into a manual slidable drawer. Only time will tell whether the OnePlus 7 will look anything like the handset in this video. If OnePlus sticks with its typical release schedule, the company will likely launch its next flagship handset between May and June next year. OnePlus is also tipped to debut a new 5G compatible smartphone in early 2019.